"You'll never think of cheese sandwiches the same way again!" totes this simple and tasty Vegetarian Times recipe...and they're right! Grating the cheese is the most time-consuming (and annoying) part of this dish, but once that's done, the rest of it is a breeze and you'll have a hearty meal in no time. I used Emmenthaler instead of Gruyere (because it was cheaper), but I think either cheese would work well. A vinaigrette of red wine vinegar, Dijon mustard, and olive oil is prepared, then the grated cheese, chopped shallots, and chopped parsley are added. Stir it all up, and you're done! The "salad" has such intense flavors: the cheese is salty and rich, the Dijon is super pungent, the shallots add a fresh spiciness, and while the parsley flavor is mellow, there's so much of it that it becomes an herbal power punch. All that said, serving this on a sweet, toasted bread with ripe, juicy, sweet tomatoes makes the dish absolutely amazing. The sandwich becomes hearty, filling, gourmet-like, and full of so many overwhelming flavors (but overwhelming in a good way). Make again? Yes. 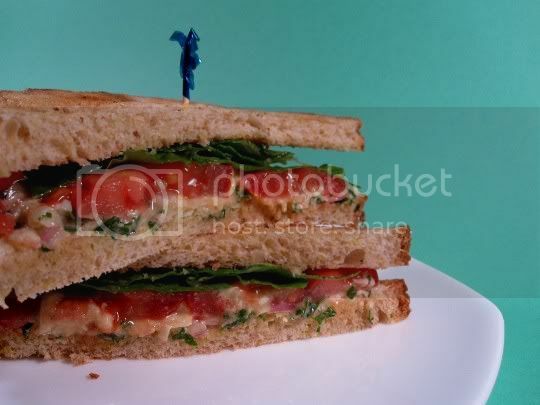 This would even be good as a dip or thinly spread on other kinds of sandwiches to substitute for a slice of cheese. Vegan variation: Substitute vegan cheese.